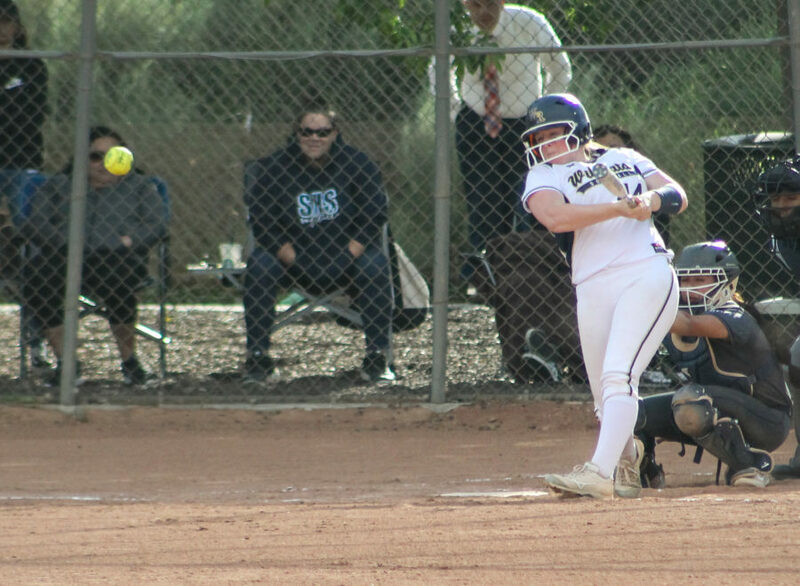 With a scoreless game in the third inning, Valencia softball’s Noel Dominguez stepped up to the plate and stared down Golden Valley pitcher Cassidy Cangemi. “I just went up there confident that we could bring (runners) in,” Dominguez said. “My team’s relying on me to do it and I was just standing up there confident and knowing I could do this. And it just happened.” “It” was a two-run triple that was rocketed towards center field and sparked some energy for the Vikings to eventually led to a 5-3 win over the Grizzlies. With the win, Valencia handed Golden Valley its first loss of the Foothill League season and claimed first place in the league standings. “I think the biggest message for us was we can’t take anybody for granted,” said Valencia coach Donna Lee. “We have to respect every team and work hard, continue to work hard every day in practice. 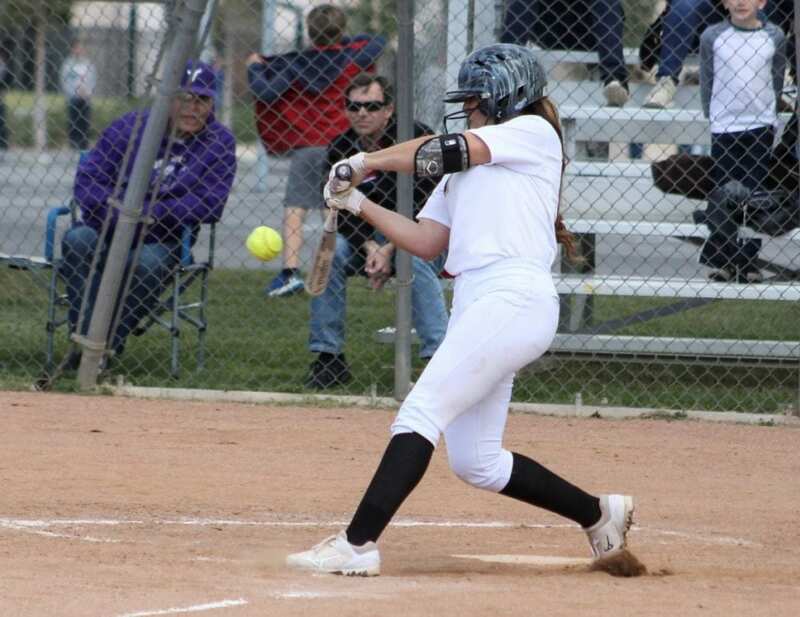 We’ve got to win every inning.” After Dominguez hit her triple, she crossed home plate on a catcher’s error to give the Vikings a healthy 3-0 lead. The Grizzlies battled back in the fourth inning as Sophie Medellin smacked an RBI double to prevent a shutout. “They didn’t hang their heads,” said GV coach Daniel Soto. “And I think in years past they would have. They would say ‘Oh, here we go, we’re done now’ and let them go out and win the game. But they didn’t.” Valencia’s Ally Shipman countered with a triple that drove in two more runs for a 5-1 lead in the fourth inning. Jasmine Carbajal hit a sacrifice groundout in the fifth inning as the Grizzlies made one more push for a win. In the next at-bat, Cassidy Cangemi hit an RBI double for GV’s final run of the game. Cangemi also threw for seven innings, recording nine strikeouts while giving up six hits. “We just wanted to jump on her first pitch and hopefully cash all the runs in,” Dominguez said. “Luckily me and Ally both were able (to) and gave credit to all the girls who got their hits before us to give the opportunity to cash them in.” Valencia plays Kennedy of Granada Hills today in a rescheduled game before resuming league play against Canyon at home on Tuesday. Golden Valley plays at Hart on Tuesday. Both games begin at 3:15 p.m.
Makayla Lopez led the Centurions with a three-run homer. Libbie McMahan was 3-for-4 with two RBIs and Gracie Keene and McKenna Gibson each chipped in one RBI apiece. Leslie Reynaga gave up two hits while striking out 11 in seven innings. For the Indians, Meghan Dragaloski went 1-for-2 with a single to drive in Hart’s only run of the afternoon. Saugus moves to 13-6 and 2-2 on the season and hosts West Ranch on Tuesday, while Hart is 7-12 and 2-2. Kate Post and Rylee Grossman each had an RBI on the day, going 2-for-4 and 1-for-2, respectively. Post also pitched 6.2 innings giving up one run, six hits and striking out two.